When you look at Doom, you can clearly see a large-scale game that is made up of minor details. It is the details that make up the unique character of Doom, even the latter of the Software and the spiritual successors cannot create the same impression. When it comes to Doom, what will people remember immediately? It is a simple way to play and shoot attractions, screen design with classic corners, but perhaps no one has ever thought about the story going on until now after the fire blood shooting.We do not discuss the story of the game, because it is almost “invisible” and players will not pay attention to it without reading a text file attached. Doom starting from the booklet containing Tom Hall’s original script and design is much more complicated, with details like ghosts lying on the way, players use a broken hand. Leaving to open the door, the events in the game take place on a planet called Tel Tanga rather than the two Mars moons we once knew when playing through the game. However, almost all of Tom Hall’s details are not approved, because John Carmack thinks there are many elements of the game that make the game’s pace slow. Giving a planet nobody knows makes players think too much and so on. Doom doesn’t need to be a diverse game to deserve its name. 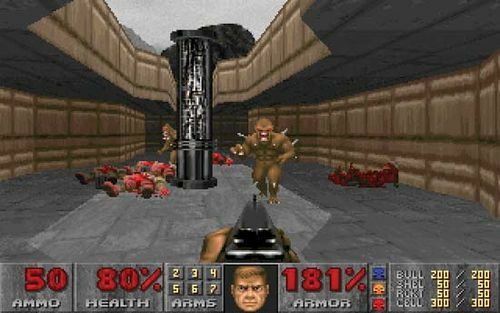 However, the official version of Doom still possesses many interesting things from the first design version, in addition to the values ​​that it is widely known for, especially in the screen design and environment over regulations large and small tissue. Some of the first areas are set on Phobos and Deimos for “corruption” as the basis for the invasion of creatures that rise from hell. UAC’s experiment failed and became an unforeseen disaster, the silver steel doors and the state-of-the-art equipment were covered by the red of blood, of hell, of destruction for life.